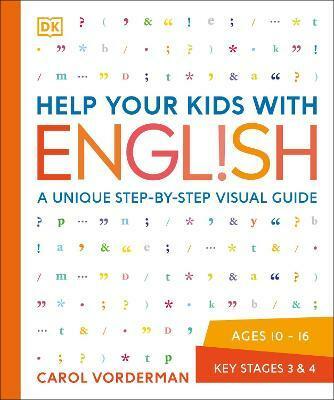 Continuing the best-selling "Help Your Kids..." series, this simple, visual guide helps parents and their children to understand and use the English language, including grammar, punctuation, spelling, and communication skills. Carol Vorderman combines pictures, diagrams, and easy-to-follow instructions and examples to cover all the important areas, so you can approach even the most complex English concepts with confidence. Whether you are a kid who wants to structure and write the perfect essay, a parent confused by the words "disinterested" and "uninterested", or a teacher who needs a refresher course in using commas, Help Your Kids With English can help. It also includes colour-coded cross-references on every spread to show links between language ideas, as well as a comprehensive glossary of key terms at the back of the book. This clear and accessible book aims to reduce the stress of studying English and helps your child with their classroom projects and homework. It is the perfect guide for every frustrated parent and desperate child who wants to understand English and put what they've learnt into practise. Carol Vorderman, one of Britain's best known and loved TV personalities, feels passionately about the value of education. Carol joined forces with DK in 1999 to become DK's Education Champion and has helped them to build the bestselling "Made Easy" series, which includes topics in maths, English, and science and technology. She has also encouraged parents and their teenage children to work together in the "Help Your Kids" series, which includes Help Your Kids With Maths and Help Your Kids With Music. Versatile as ever, Carol has also provided an accessible and fun entry into the world of computer programming with Computer Coding Projects For Kids.